Put the oxtail pieces, hen, fat, hall of the carrots, hall of the celery, tomato puree, 2 garlic cloves and the halved onion (with peel) in a baking tray and roast in a hot oven until Well browned, stirring occasionally (app. 45 min). Put everything into a stockpot together with the green part of the leek and the stems of the parsley. Cover with water and bring to a boil. Skim. Add thyme, bay leaves and peppercorns. let simmer, covered, for 2 1/2 hours. Pick up the oxtail. Remove the meat and set aside. Return the bones to the pot and let simmer for another 1 1/2 hours. Strain the stock and remove some of the lat. Discard the hen (or use for something else). Cut the rest of the vegetables, except one beetroot, into strips. Heat the butter in the cleaned stockpot. Add the rest of the carrot, beetroot, celery, garlic, leek and flour and fry on medium heat for a few minutes. Add potato, cabbage and the stock and bring to a boil. let simmer until the vegetables are done (approx. 15 min). Add the meat. Grate the remaining beetroot finely and mix with the vinegar. Chop parsley and dill. Add salt, black pepper and a little sugar to taste. If the soup tastes bland, enrich with bouillon cubes. Add parsley to the soup and bring to a boil. Finally, stir in the grated beetroot and vinegar. The soup will at once take on an intense purple red color. Do not boil the soup from now on. 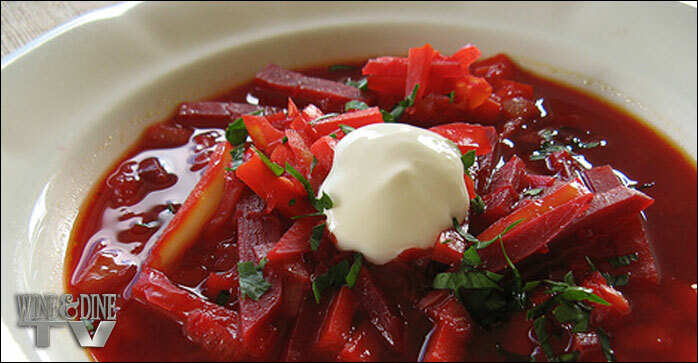 Serve hot, sprinkled with dill and a dollop of sour cream in the bowls. Dark sourdough bread and butter on the side.